STEVENSON, Alabama – Almost two years ago, Brown-Forman Cooperage, a subsidiary of the company that makes Jack Daniel whiskey, opened a mill in Stevenson to produce oak staves for the whiskey barrels that help give the liquor its distinctive taste. Since that time, Bob Russell, the company’s manager of mills and wood procurement, said the Louisville, Ky.-based Brown-Forman Corp. has had a great relationship with the city and its people. He is confident that the company, which studied dozens of possible sites in the Tennessee Valley region, found the ideal location for the mill. Stevenson, which stands on the edge of the Tennessee River in north Alabama’s Jackson County, has advantages that make it a natural fit for a variety of manufacturers. The town of about 2,000 residents is located within a two-hour drive to Birmingham, Atlanta and Nashville, and just 45 minutes from Chattanooga, Tenn. It’s only minutes from two interstate highways, and the four-lane U.S. Highway 72 extends to Huntsville, one hour away. 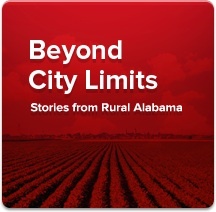 Brown-Forman operates a mill in Stevenson, Ala.
Stevenson Mayor Pro-Tem Bob Spencer said the work ethic of the city’s residents is a top attraction for businesses seeking to locate or expand. “Many of our residents work on farms — they know what hard work is,” he said. “Not everyone knows how to do hard industrial work. It is part of the lives of our people. They have a work ethic that is second to none. Spencer said the town has constructed new parks (including an RV park) and boat docks to make the area more attractive. Other attractions include three forts, including an earth mound fort from the Civil War. “We take advantage of our history and the river in our efforts to make Stevenson more attractive,” he said. Stevenson officials hope other businesses will follow Brown-Forman’s lead and consider the area. Available for industry is 40 acres of land with rail service running through it. Vinson said the land is less than two miles from the highway and a short drive from Chattanooga. “We want to show industries that they are welcome here and we tailor our services and products toward their needs,” Vinson said. Russell said Stevenson offered the raw materials the company needed for its barrels. At a 55-acre site just north of Stevenson, the mill uses grade white oak logs to produce staves, the narrow pieces of wood that that make up aging barrels used at the Jack Daniel distillery in Lynchburg, Tenn. The company currently employs 29 people and also does business with approximately 40 different area loggers. Plus, Russell said, the company conducts extensive business with the local community. AIDT, a division of the Alabama Department of Commerce, was instrumental in screening employees for the Brown-Forman mill as well as conducting training sessions for workers. For area businesses, workforce training is available in nearby Rainsville at Northeast Alabama Community College, which can rapidly customize training programs to a company’s specifications. Also available is The Earnest Pruett Center of Technology (EPCOT), an educational extension of the eight high schools in Scottsboro and Jackson County that provides advanced training for students who want to be ready for the 21st Century work force.